I can’t wait to get started with decorating. While I might not go all-in this year because our house is a mess due to some serious renovations, I’ll make sure to have at least a few touches evergreen branches, eucalyptus twigs and hyacinths in bloom here and there, to add some festive spirit around here. 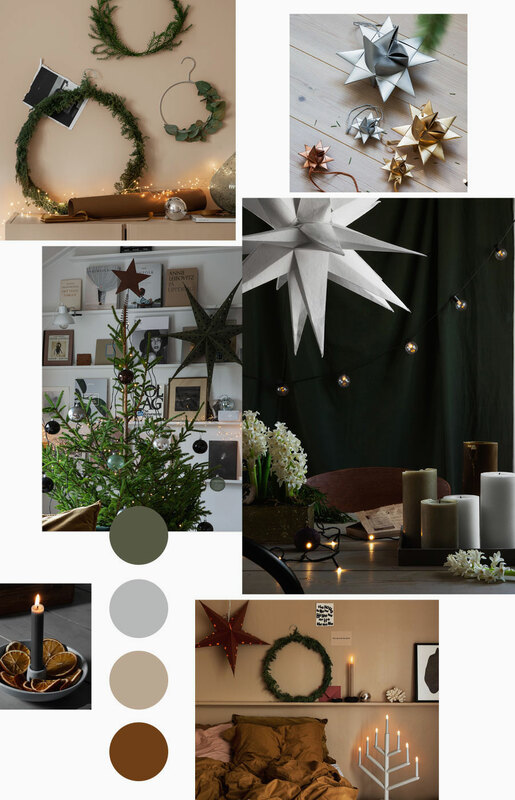 Is your home all decked out and Christmas-ready? 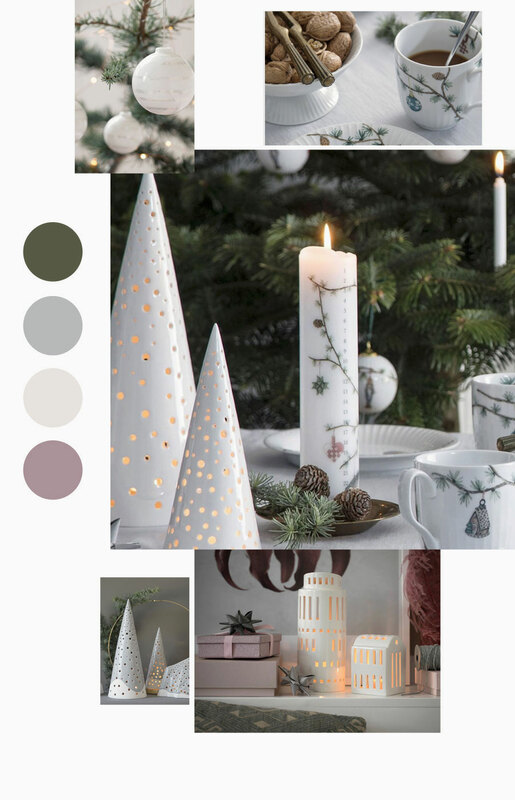 If you are still looking for inspiration, I’ve created six collages with Holiday-themed pictures from Scandinavian brands to help you to create a look you’ll love, whether it is rustic or refined, glitzy or understated. For more holiday inspiration, have a look at last year’s roundup as well as at the dedicated board in my image gallery. 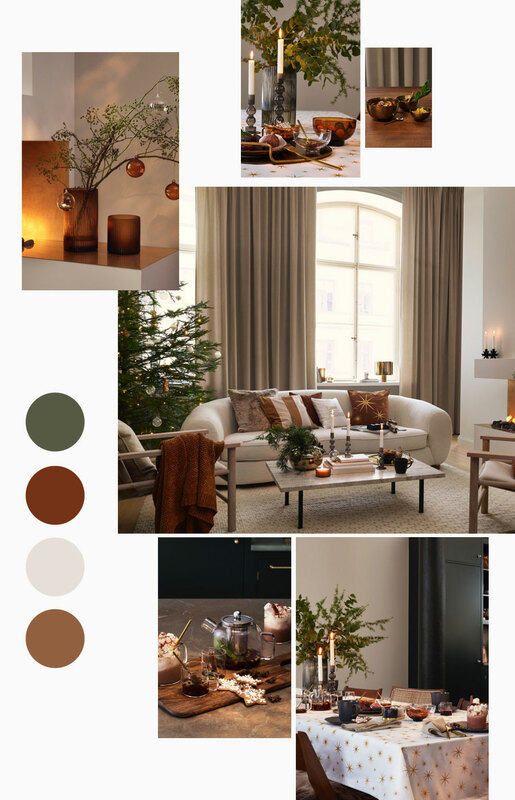 The chain of affordable homeware stores incorporated warm beige and rust hues in its Christmas look -two popular colors in Scandinavian interiors lately- combined with grey and green. 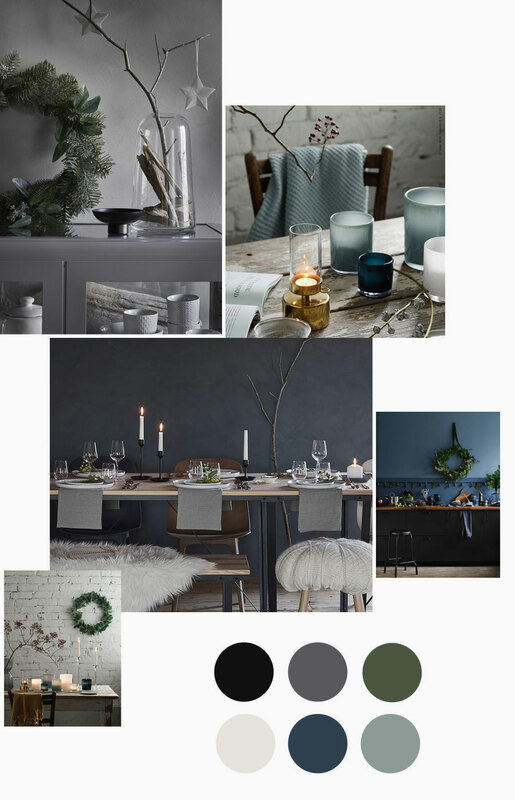 Metallic, whether brass, steel or copper, add a festive touch. 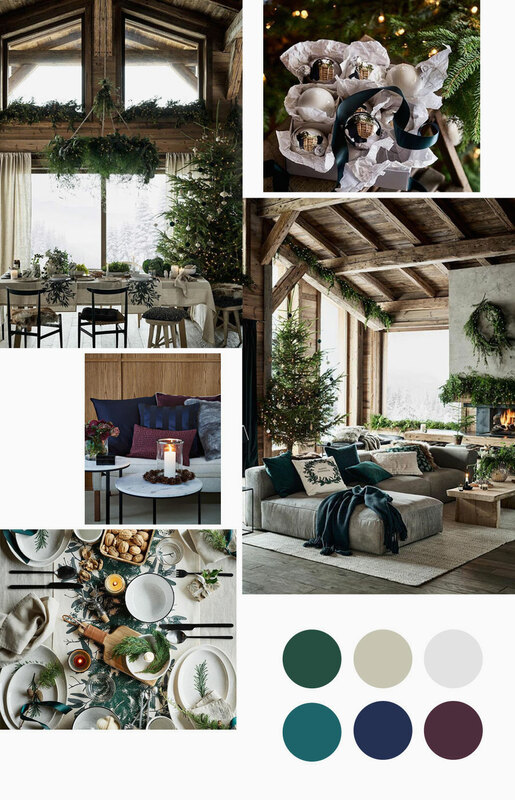 The Swedish retailer opted for a look with lots of evergreen branches, white and mirrored ornaments, cream-colored textiles, as well as accents in teal, blue and purple. Just like last year, HM’s style has a more rustic, cozy and traditional look & feel. 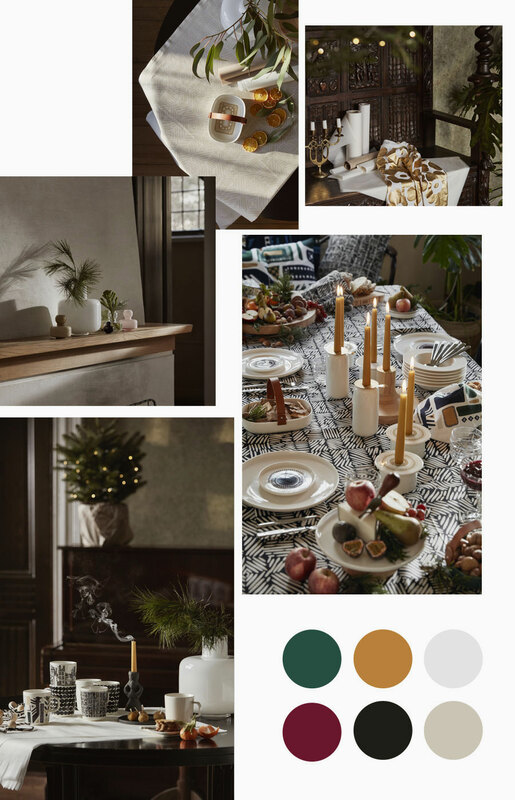 HM’s second Christmas concept features a neutral base, with shades of rust, orange, amber, ochre… Brass details add a touch of shimmer to the festive look, and notice also the extensive use of colored glass. Beautiful, modern, and elegant – I am particularly fond of this one! 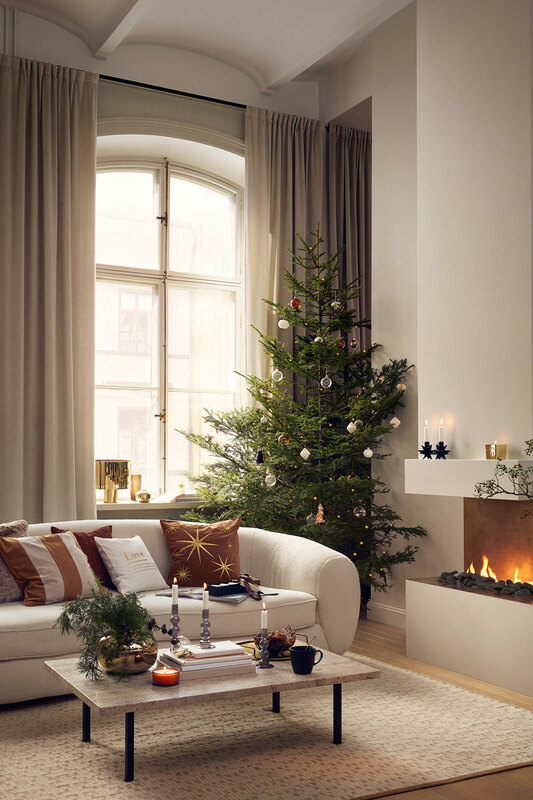 The Finnish brand is the only one in this roundup to include a hint of red in its Holiday decor concept, but it is very subtle – With only a vase or fruits here and there. The palette mostly consists of black, white, sand and green. Yellow candles were also used in the décor, which is a nice, cheerful touch. This year’s look according to Danish ceramics manufacturer Kähler is understated, soft and delicate: Mostly white, with touches of light grey, dusty rose and blue. IKEA went for a dark and moody look, and used dark greys and blues with black accents and the occasional brass touches. All different, and all so beautiful – Which look do you prefer?